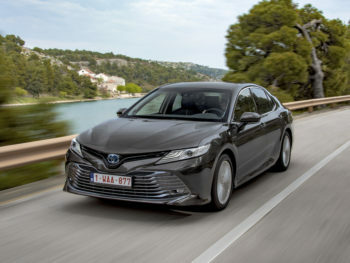 Bringing a more direct rival to the Mondeo, Insignia and Passat, the Camry is offered solely with a 2.5-litre petrol-electric hybrid drivetrain for the UK, offering official combined WLTP fuel consumption of 50.4 to 53.3mpg along with NEDC Correlated CO2 emissions of 98g/km to 101g/km. It’s available in two trims – Design and Excel – with OTR pricing starting from £29,995 for the Camry Design and £31,295 for Camry Excel. Standard equipment for the Design includes 17-inch nine-spoke alloy wheels, metallic paint, leather upholstery, LED headlights, dual-zone automatic air conditioning, smart entry and pushbutton start, front and rear parking sensors, reversing camera, heated and power-adjustable front seats with lumbar support, seven-inch TFT multi-information display and Toyota Touch 2 multimedia system with seven-inch touchscreen, navigation, Bluetooth and DAB. Active safety systems under the Toyota Safety Sense banner cover Pre-Collision System with pedestrian detection, Adaptive Cruise Control with full speed range following, Lane Departure Alert with steering assist, Road Sign Assist, Sway Warning and Automatic High Beam. The Camry Excel builds on this specification with 18-inch 20-spoke alloys, LED fog lights, LED dual-beam projector headlights, Blind Spot Monitor and Rear Cross Traffic Alert with braking assist, wireless charging tray and Intelligent Clearance Sonar. Order books are open now with UK customer deliveries from 1 July 2019.